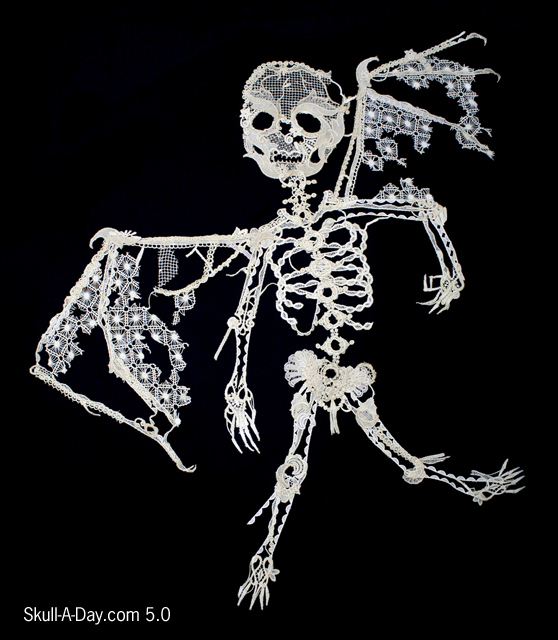 Today's skulls are all a result of things that dropped. 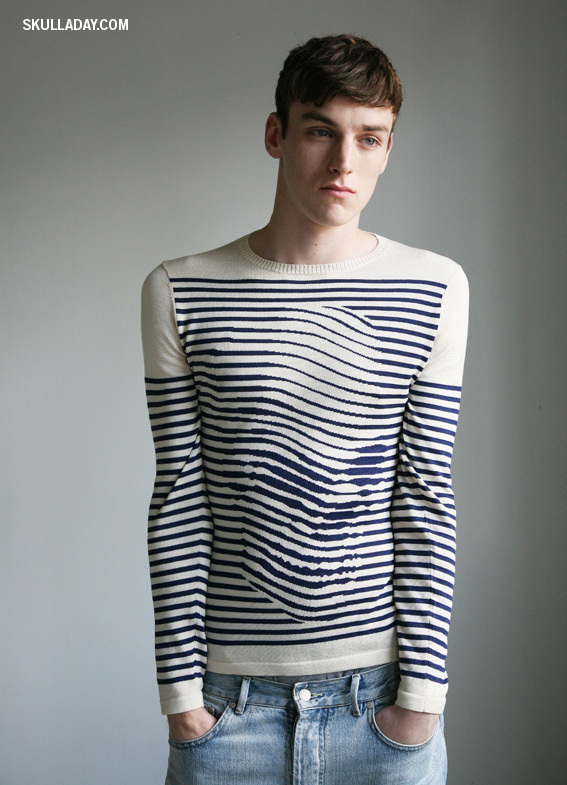 Jean-Baptiste Bellon from Bagnolet, France say, "I discover it in the concrete of my workshop." 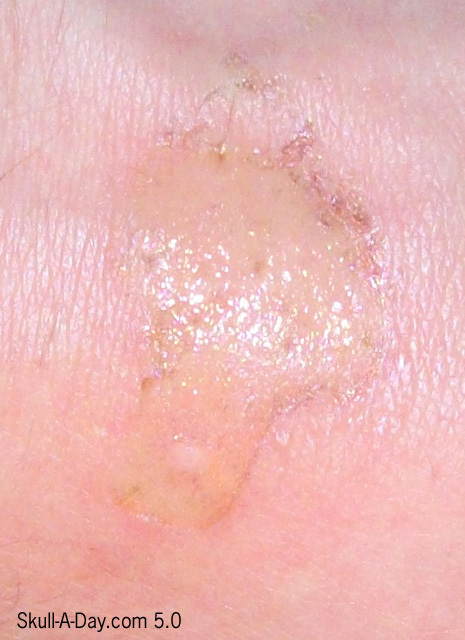 Christina from Richmond, Va explains her submission "My oldest son was making some hot tea and spilled a bit on his hand. 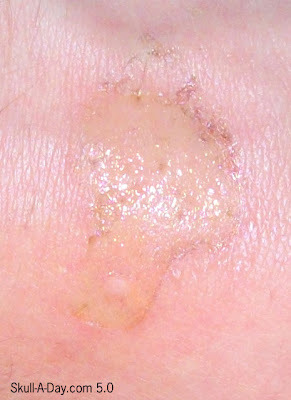 I was painful but the burn was in the shape of a skull!" Gabby from Evansville, IN said, "This Skull was made when a bird pooped on the hood of my car." I know that no one likes having to go to school on Saturdays, but here's an excellent skull lesson for us from Aaron Witham at Gilford Middle School in Gilford, NH. He writes, "I have my sixth graders create a coil pot with a face (ugly jug or face jug). My seventh graders create sgrafitto slab pots. I took both projects and combined them into this sgraffito skull coil pot." 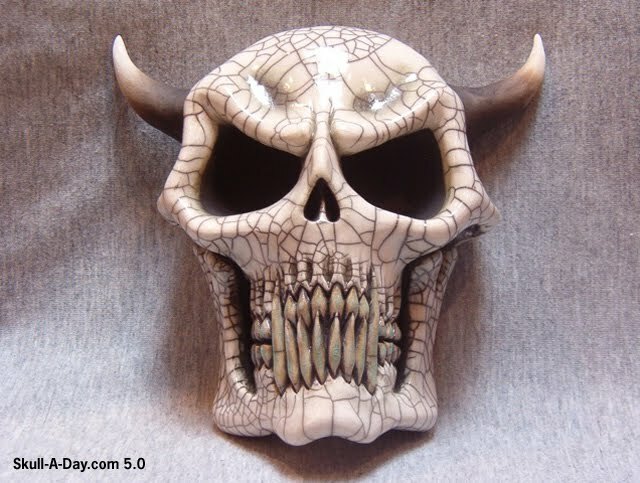 I've seen lots of these face jugs before, but I can't recall seeing a skull jug like this one. Kudos to you, Aaron, for teaching others the ways of creativity. If this is an annual project for each year then maybe we'll see more of these in the future. Thanks so much for passing your jug our way! 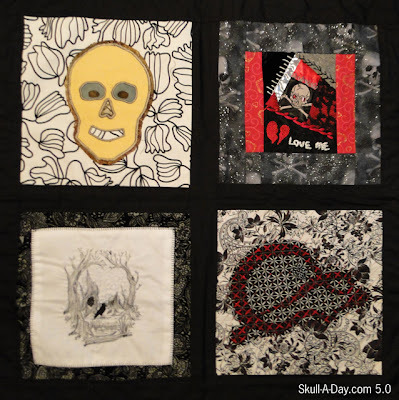 The Skull Quilt Project: 6 Quilt Auctions Starting Today! The Ebay auctions for 6 more quilts. The auctions will run for 5 days. You MUST have an Ebay account and a Paypal account to bid and pay for the quilts. You can follow the steps for set up, if you don't already have those accounts. 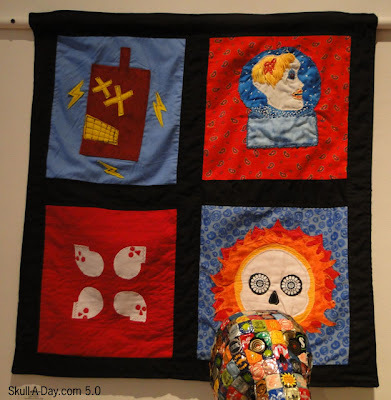 For information on each quilt, please see the auction listing. Proceeds from the sales of all of the skull quilts will go to Becky's Fund, which is a DC based organization that helps victims of domestic violence. This was made by Carolyn Oord of Forest and Kerosene from Canada. These were sent in 3 packages with a 3 square strip in each. This was the least expensive way of sending them. 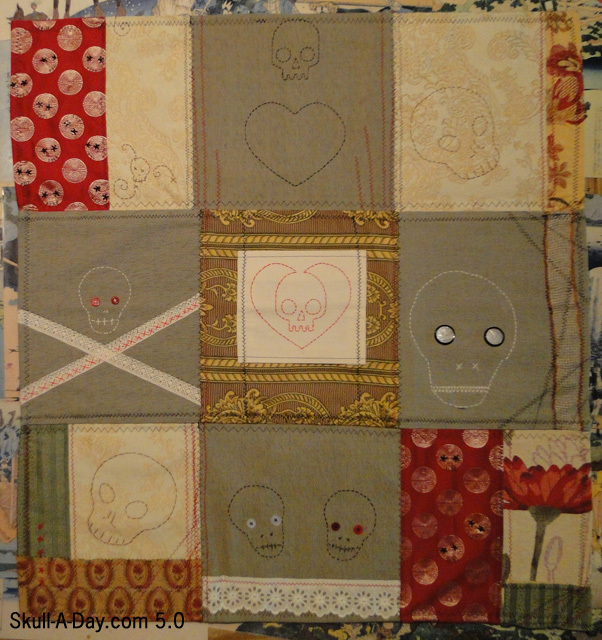 Since they were sent sewn in strips, the construction of the quilt changed completely. I sewed the strips together according to the placement instructions that she provided me with. Taking ques from the existing decorative stitching Carolyn already had done, I used similar decorative stitching to top stitch it flat to the backing. This quilt features the logo from our Skull Appreciation Day celebration and many different hand sewn skulls. There are various kinds of fabrics, trims, stitching and beading. 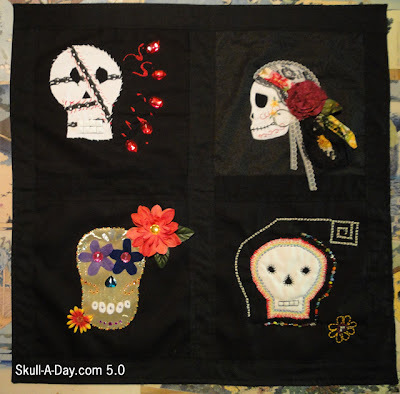 To see close ups of the pieces, visit her blog or the auction. 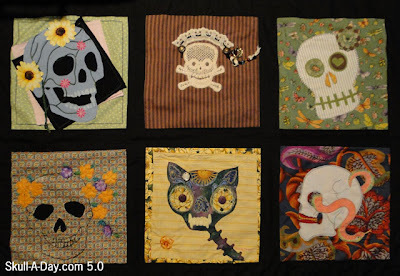 Girl Scout Troop # 202 from Eureka, California sent 12 squares that they had made. 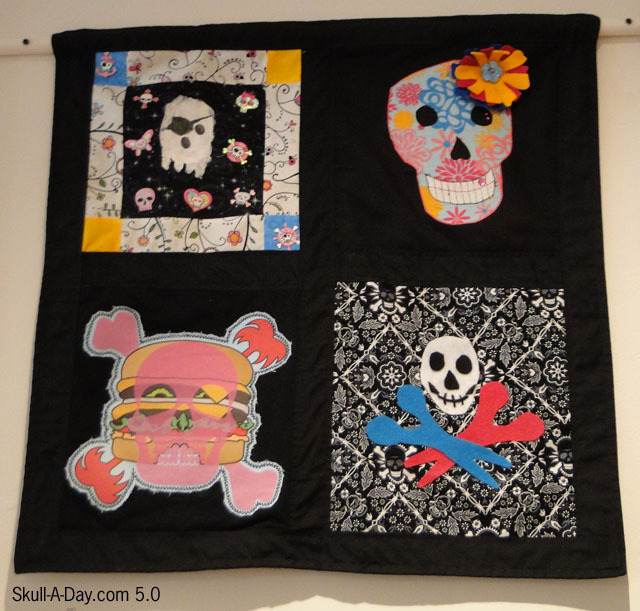 The troop has an existing fascination with skulls. Their troop crest badge was designed by Noah and made by Nerd Merit Badges. I own one of these badges, because I'm a good skull scout. Also, I used to be a girl scout, so this was extra fun for me. I arranged their submissions into 3 quilts according to similar colors. 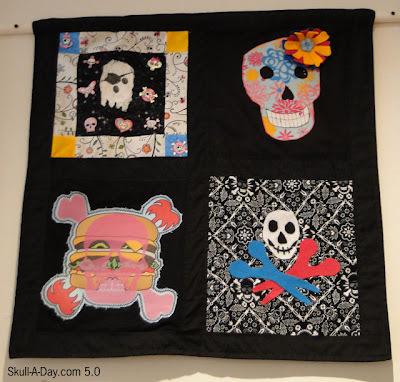 If you have any questions about the auctions, please email me at abby@skulladay.com. I am traveling this weekend, so I will reply on Sunday when I return. Next week, I will relist any quilts that haven't sold and some non-assembled blocks. There were a few that I either wasn't able to use or I wasn't able to match up to other blocks. I know you all can find some crafty purposes for them. 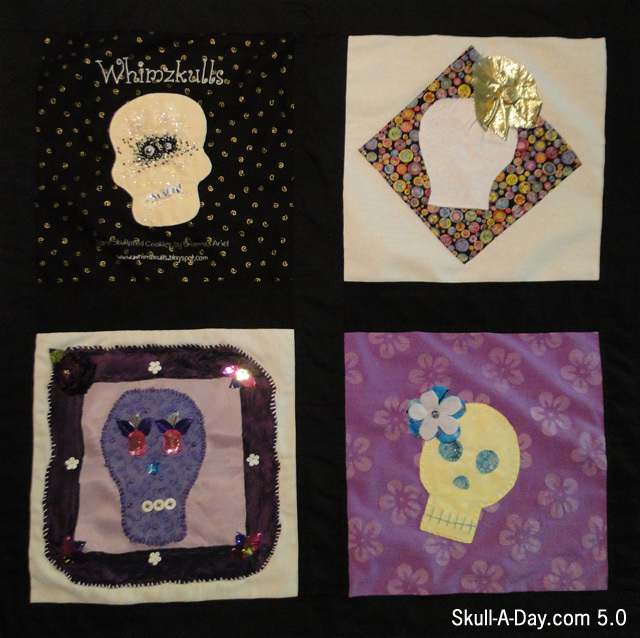 Friend of Skull-A-Day Christina Moreno, sent us a pair of her crafty creations. 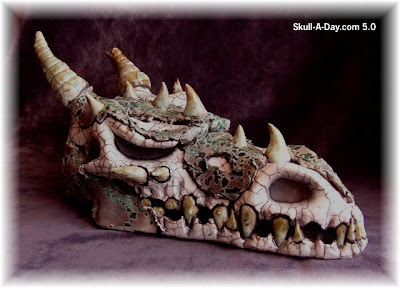 Thank you for sharing some of your skull work with us, and allowing us to share it with our readers. I get such a kick out of our submission box. I enjoy exploring the artists blogs who we have the pleasure of featuring each day, and today’s artist is another gem. 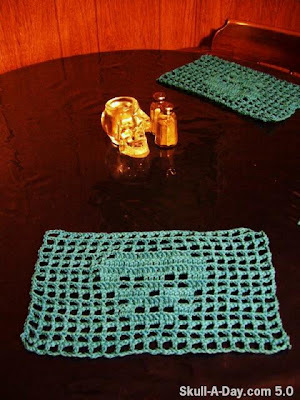 Make sure you get a chance to check out Ms. Moreno blog is full of skulltastic projects she has worked on and also some great tutorials like for the place mats above. Welcome to another addition of Flashback Friday. ** This year the guest editors, Citizen Agent, Azurafae, and myself, Tatman, are taking turns reflecting on 17 of our personal favorite skulls from the previous four years of postings. So please join us as we visit the archives and add our additional commentary on some of the original pieces. 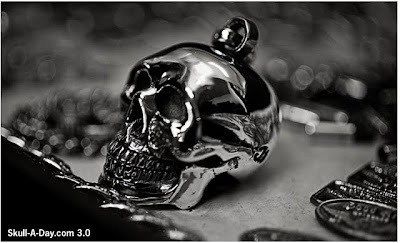 Not only does Josh Warner of Good Art Hlywd make incredible jewelry, he can cast his own skulls in various sizes and weights. This piece is one of my all time favorites because I can attest first hand to the quality of his work since I wear one of the badass mofos everyday(thanks again, bro!). Josh has tons of great work for sale in his shop, so if you wanna wear bling like the stars then check it out and pick up something for yourself. Pin Pals is having a show. You have to register and make 5 button designs. Pin Pals will make the buttons. 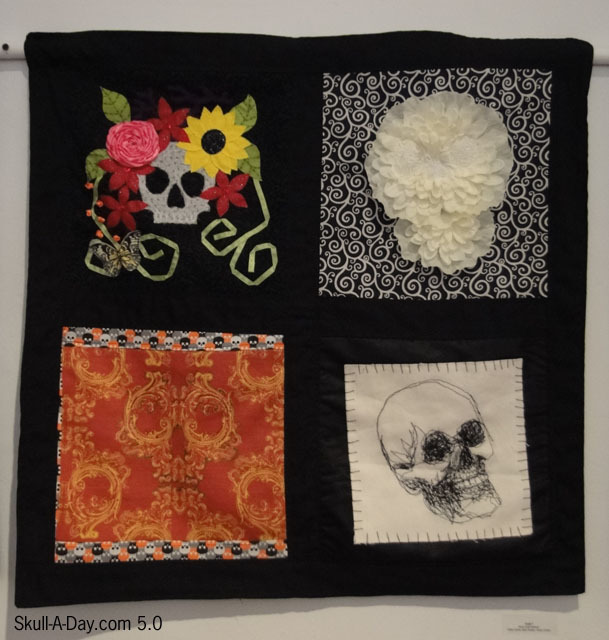 One of the buttons will be on display at Gallery 5 during September and sold to benefit Art 180. The other 4 will be distributed to other participants, which also means you will get 4 buttons from other artists. This is a simple project to get your creativity flowing. After printing out the template on computer paper, I used a drawing pen and water color pencils to create the design. 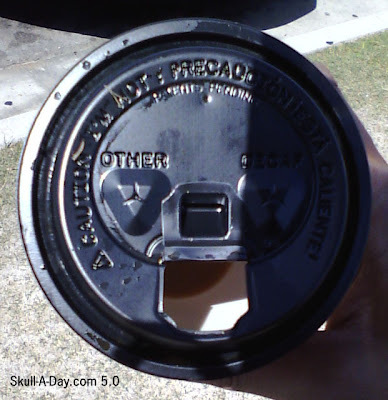 The artwork needs to be flexible enough to be molded into a button. 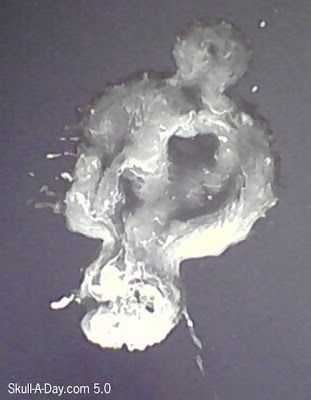 Using pliable mediums like ink and thin paint, is the best for this project. I'm also excited to eventually get 4 art buttons back. I collect buttons and adorn my car sun visor with them, so these will be a unique addition. 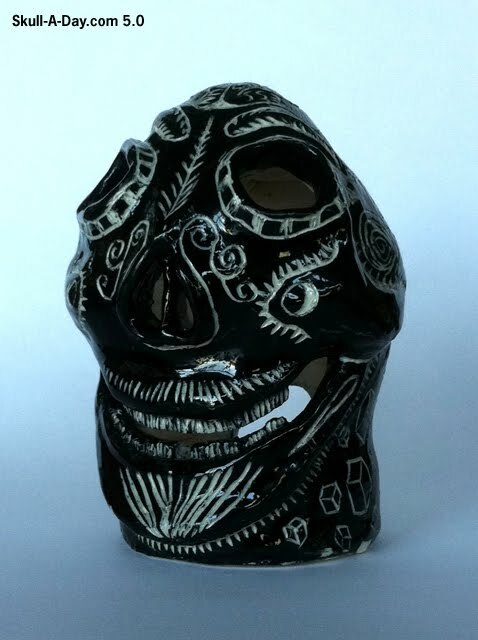 Every other Thursday in the 5.0 year, I will post my own Dia de la Abby creations Every Thursday in the 4.0 year, I posted my Dia de la Abby creations and occasionally tutorials with instructions on how I made my pieces. 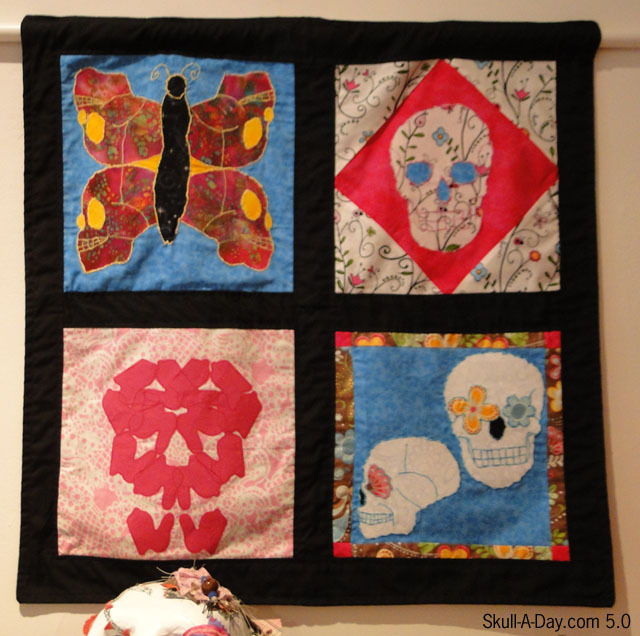 Hopefully you feel inspired by my posts just as I was by Noah's Skull-A-Day 1.0 daily project. Need more of me than just a weekly dose, follow me on Facebook, Google+ and/or Twitter. 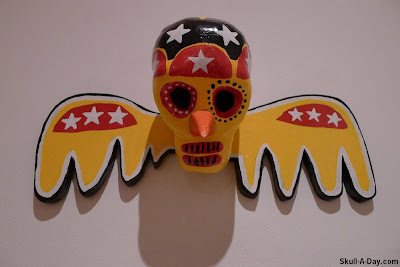 Ryan Cronin - "Skull with Wings"
On June 4, 2011 Skull-A-Day celebrated Skull Appreciation Day with an exhibit of over 100 skulls at Gallery 5 in Richmond, VA. 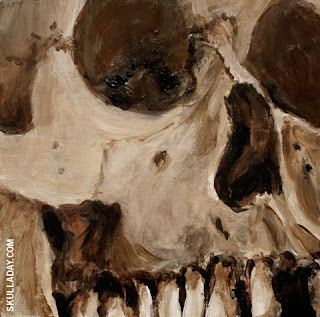 If you didn't have a chance to make it to the gallery while the show was up, we now proudly present: "Skull Appreciation Day - The Exhibition". Growing up in the 1980’s Ryan Cronin was surrounded by and embraced Pop Culture. The bright colors and sounds of punk rock, skateboarding, MTV, graffiti and the youthful, push-it-to-the-limit attitude of the time became an integral part of who Cronin is today. 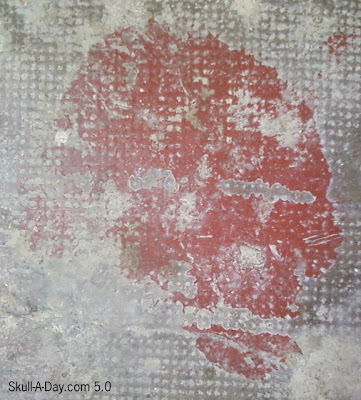 This influence is apparent in his playful, yet tongue-in-check approach to painting. The 2011 Skull Appreciation Day - The Exhibition was a collective art show celebrating the 5th anniversary of Skull-A-Day.com and its tremendous audience of artists and readers. Throughout year 5.0 we will be featuring artwork from the show a few times a week. 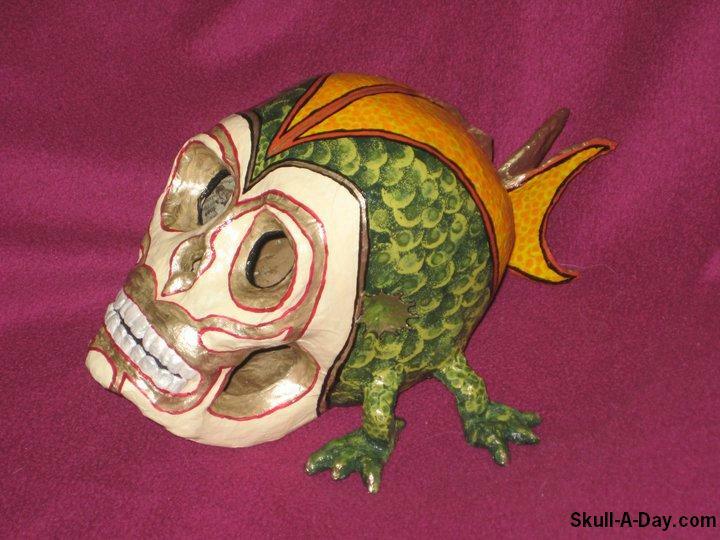 This is a chance to see all of the excellent skulls that were on display, and FOR SALE. Some of these pieces may still be available and this is a wonderful opportunity to own an original piece of skullriffic artwork. There are many well known artists who have contributed very reasonably priced works and many of them have donated their portion of the sale to benefit a great charity, the Richmond Peace Education Center. Please take a moment to view all of the remarkable work that was created for the onset of this annual festivity. Your skull will appreciate you for showing it some love. 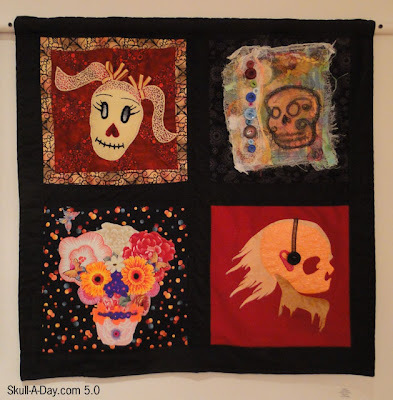 The Skull Quilt Project: 7 Quilt Auctions ENDING TODAY! 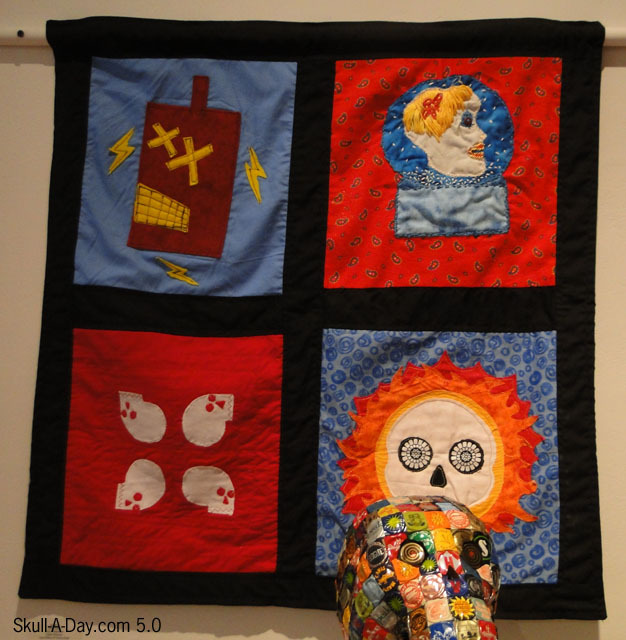 The 1st 7 quilt auctions are ending throughout today. If you haven't bid yet, this is your chance to do so! 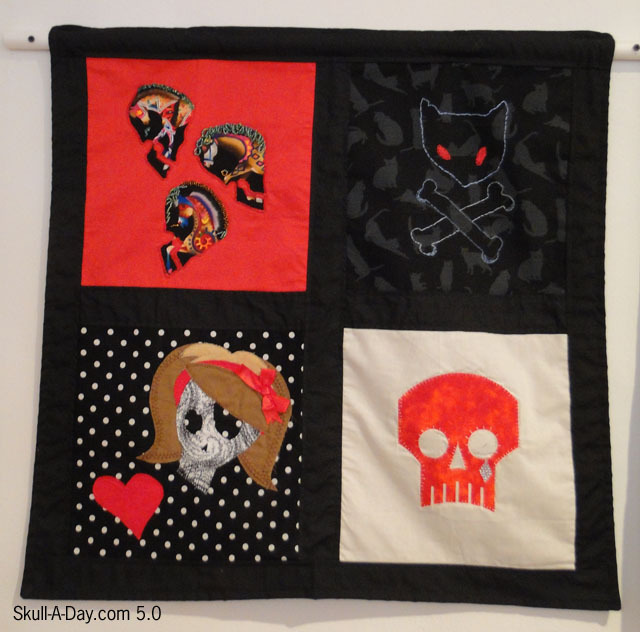 Proceeds from the sales of all of the skull quilts will go to Becky's Fund, which is a DC based organization that helps victims of domestic violence. We really appreciate all the hard work that went into creating this quilt squares and the bidders who are purchasing them. 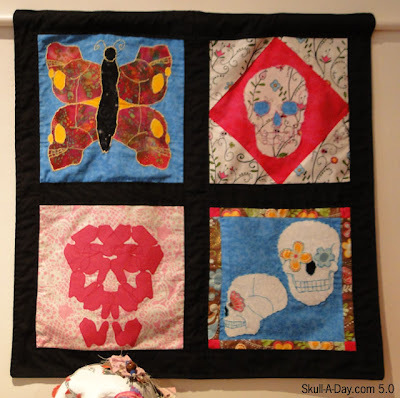 When you are bidding, think of the quilts as 4 pieces of one-of-a-kind art, put into one. That is literally what they are. 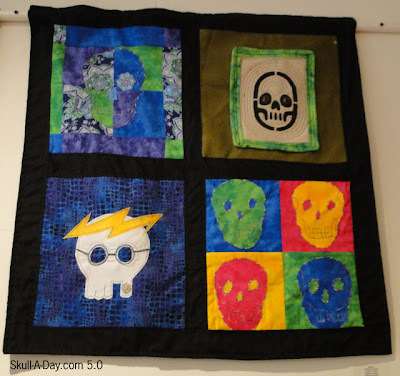 To see all the auctions and bid on a quilt, go to Azurafae's Ebay store. 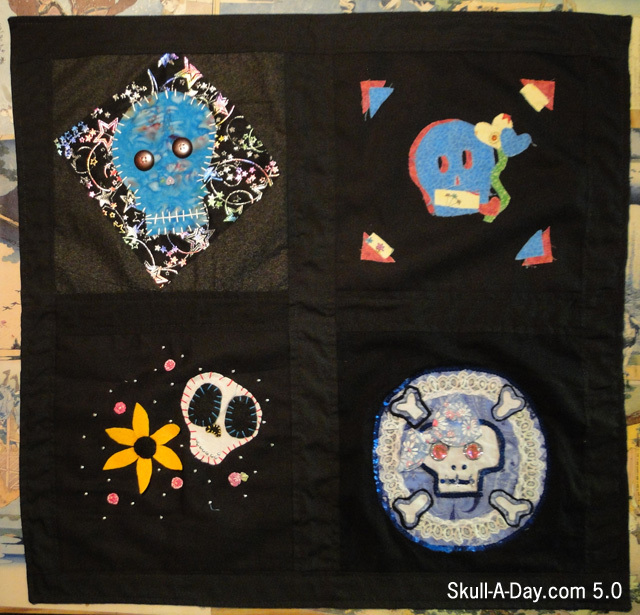 The remaining 6 quilts will go live tomorrow, after this set has ended. So, if you don't see your favorite yet or your own block, don't fret, they will be up tomorrow! Thanks for participating and buying these quilts! Antonio Palanza and Enrico Cucchiarelli, the founding members of Ready for Duty studio, made this skull during their lunch break. 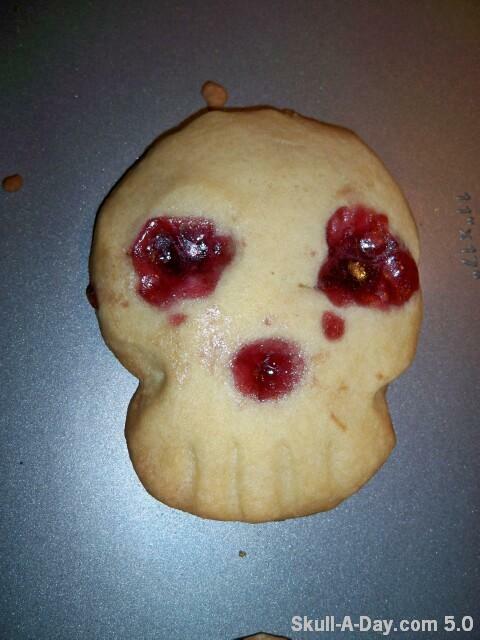 We here at Skull-A-Day definitely condone playing with your food. I like the sudden burst of creativity that food always lends it's self to. 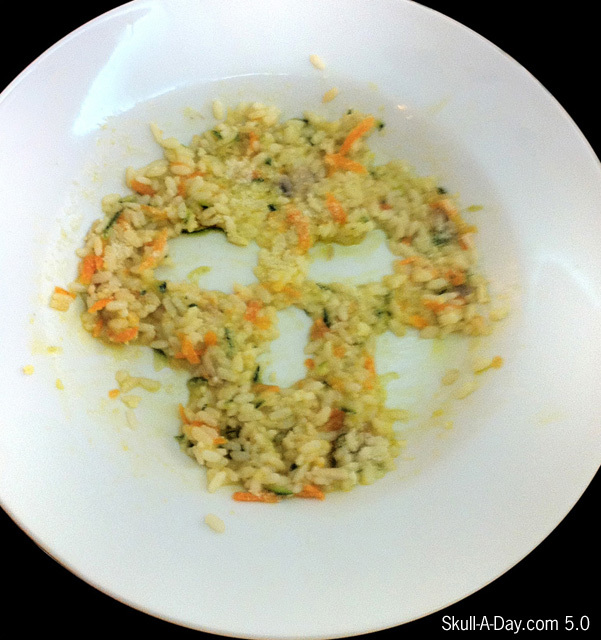 Without creativity, we wouldn't have many delicious foods. Please visit the artist’s exhibit page for information if this work is available for purchase. C is for cookie! Perhaps it is the temporal aspect of them, but I love edible art. It is rather fitting here that your subject matter is that of the skull once again reminding us of our own temporary nature. 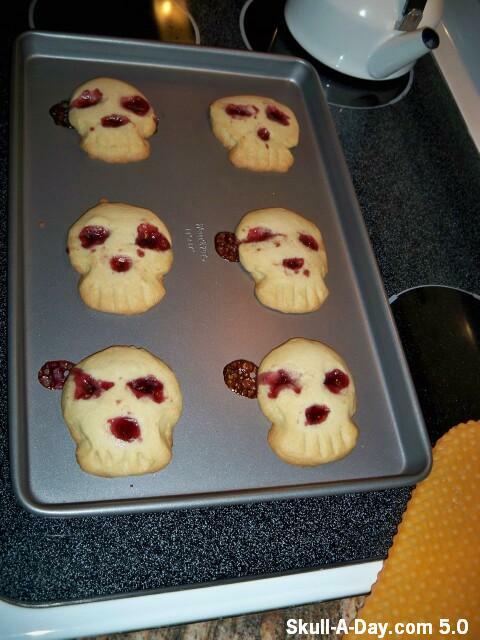 Thank you for sharing this Skullinary creativity with us, bloody eyes and all. 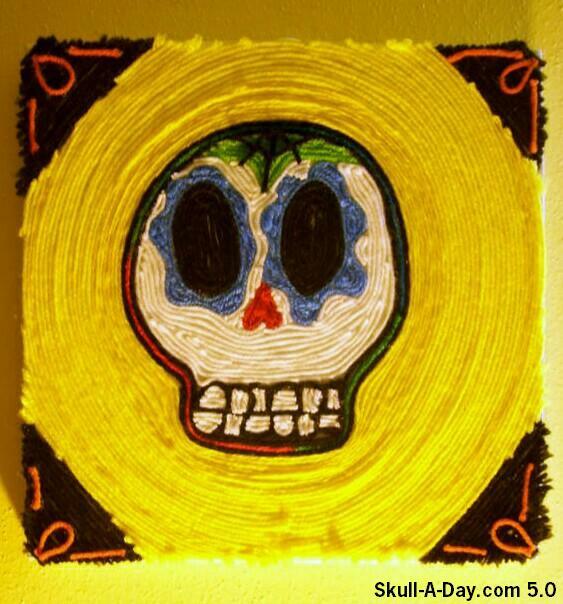 Noah Scalin is the co-curator of the Skull Appreciation Day Exhibition and the creator of Skull-A-Day. See the original post about this piece for more views and details about its construction. Riding somewhere through the hills of Denver, Colorado is Jon Grinder sporting this skullaciously stylish helmet. Jon shared this note, "I thought you might enjoy my custom-painted Skull Bucket, "Mr. Lucky". 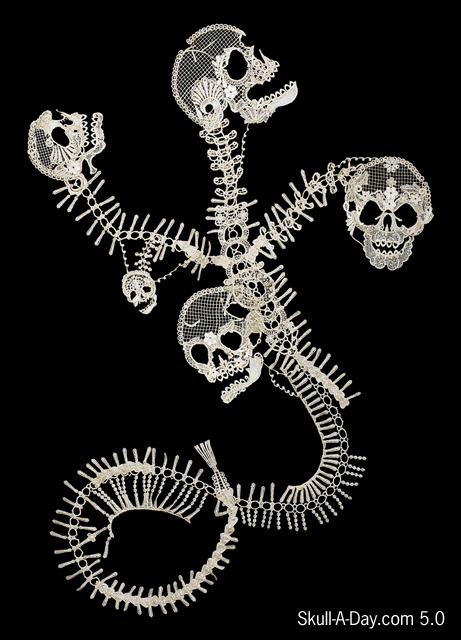 I tried to make a lace, or paisley look with the skulls. I hope that people are surprised when they see it close-up and see that the overlapping skulls make up the pattern". This is an awesomely unique way of decorating your cranial cover, Jon. My own helmet has skulls on it, of course, but your "Mr. Lucky" bucket takes the prize for being personalized. It's a great nickname as well so here's to many happy rides with Mr. Lucky by your side, uh, I mean on your head. Thanks, Jon! After a hectic week I finally found myself with some time to get back to painting. I especially like doing these when I need a distraction from the other projects & client work I'm in the midst of. 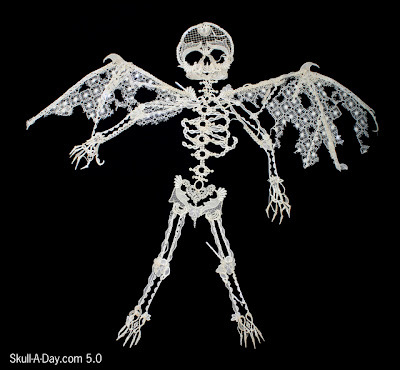 I was looking at a fashion set made by someone and noticed a skeleton made of lace. 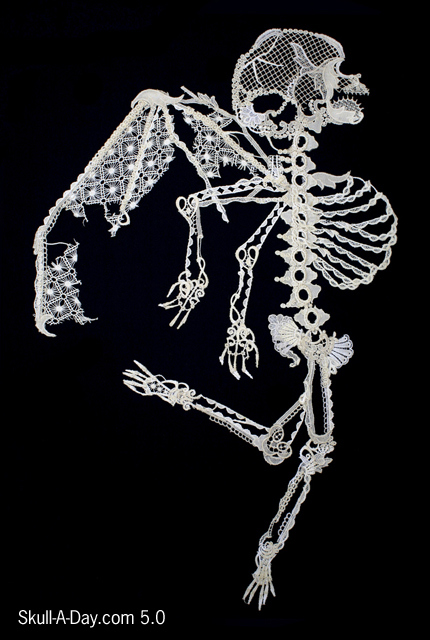 With some research, I found out this beautiful work of art was made by Sandrine Pelletier. She works with many mediums in unusual and beautiful ways. The Lacex collection is by far my favorite. Sandrine is a Swiss based artist that "works in a variety of media including sculpture, textile, drawing, installation and performance." Today's skulls were found in beverages. 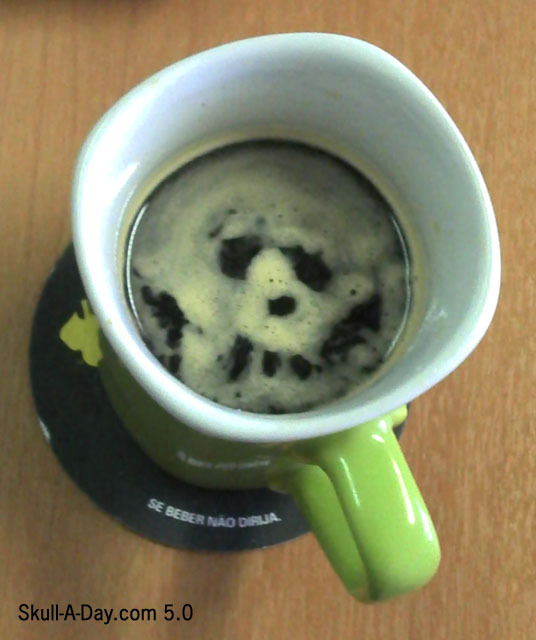 Magskull (Mag = Portuguese for "skinny" + "skull") found this skull in their coffee. 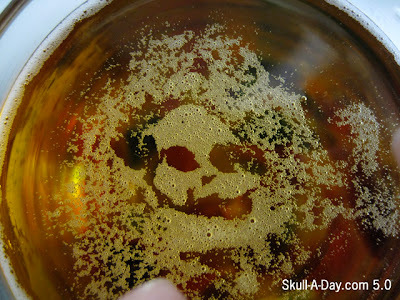 Al Frank in Austin, TX found this skull on the lid of his drink. Stacy in Sasebo, Japan said "So, I pour myself a nice cold glass of Asahi, and this is what I found a few minutes later." 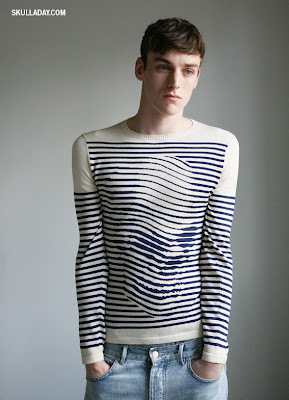 And hey, if you want one of your own, they appear to still be available in the Sibling store. Recdently my wife had the pleasure of visiting friends in the beautiful Denver, Colorado area. 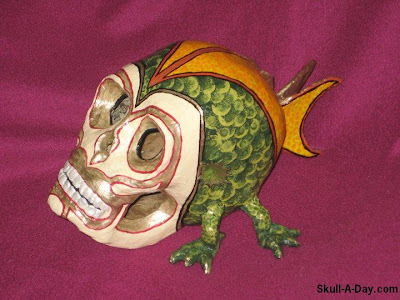 She was in love with the mountain air, the friendly folks, and the overall culture when she happened to embark upon a mission to find me a locally made skullpture for my collection. 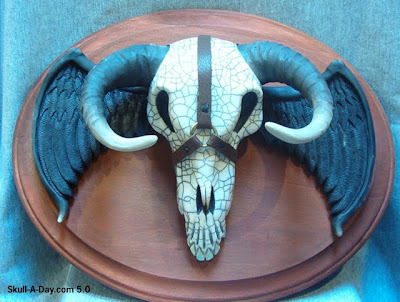 Well, after a good lead from another shop owner they arrived at the Green Horse Gallery in Manitou Springs, CO. Her expedition led her to the works of a great artist by the name of Dan Loftis. I got more info from Dan on his techniques, "All of my skulls are original, one of a kind creations. I use a stoneware or raku clay and I fire them with an ancient Japanese raku firing method. 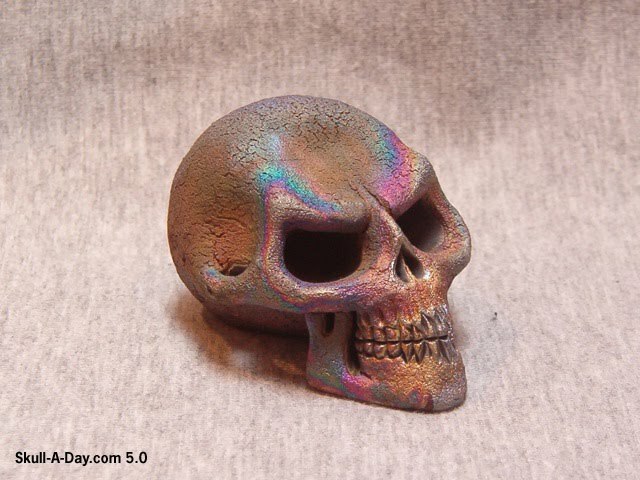 There's two techniques I use when I reduce my pieces, that's why some have a cracked appearance and others have the multi-colored metallic finish." "My main influence is Brom, but there are others that have inspired me as well. 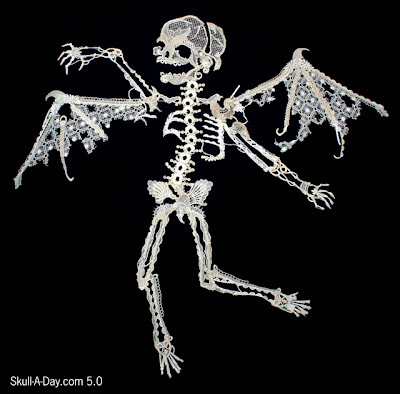 People like Todd McFarlane, Stan Winston and Tim Burton." "The reason I make skulls is something I've never really thought about before. I guess I've always been a fan of darker things, even as a child. 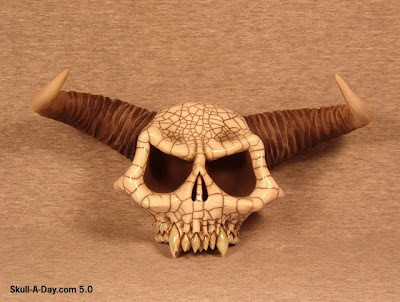 Most of my creations are of a evil or scary nature so skulls go hand in hand with everything else that I make. 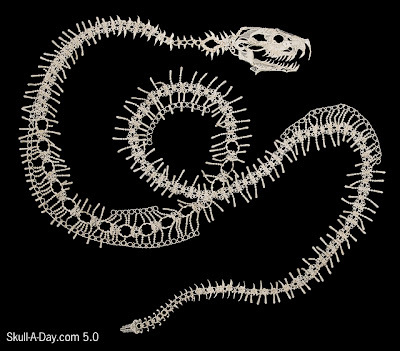 Also, skulls are frickin' awesome! Why wouldn't I make them?" You can't argue with logic like that, Dan. 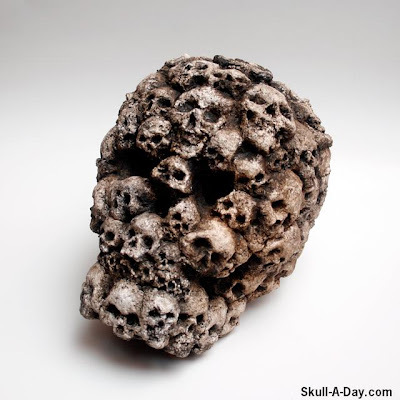 The raku fired skull that my wife picked up for me(like the one in pic#2) is definitely one of the more unique pieces adorning my dresser. Thanks for sharing all of the wonderful pieces you've created and I wish you the best of luck in your mile high endeavors. Abby Davis - "Freshly Dug Up"